MINNEAPOLIS – Cargill today released its 2013 Corporate Responsibility Report entitled “Responsibility Across Many Dimensions.” It features Cargill’s actions to meet and exceed the expectations of its stakeholders by conducting business with integrity, operating responsible supply chains, working to feed the world and enriching our communities. An expanded version of the report is available at cargill.com. Across its supply chains, Cargill collaborates with partners to tackle economic, environmental and social challenges. 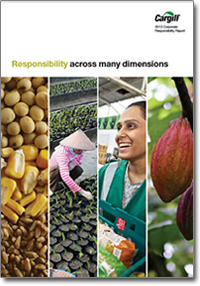 Included in the report is information on the company’s efforts to advance sustainable agriculture; its commitment to responsible production of cocoa, soy and palm; how it helps advance global food safety practices; and its work with smallholder farmers to improve productivity and incomes, to name a few. Cargill’s actions to create a more food-secure world also are featured in the report. Included are examples of the company’s global investments to increase food production; its efforts to help farmers increase yields and build agricultural capacity; and its work to combat hunger and malnutrition, and expand access to safe, affordable food. In fiscal 2013, Cargill contributed $69 million to communities in 53 countries in support of food security, education and the environment. Cargill employee volunteers logged more than 250,000 hours helping their communities respond to natural disasters; stock food shelves; build schools; and participate in environmental stewardship projects, among many examples. The Cargill 2013 Annual Report also is available today. Entitled Results Across Many Dimensions, it discusses what it means to deliver results in a world of interconnected challenges and rising expectations.